Hoult who does a masterful job of portraying the subtleties in R’s transformation from zombie to human. It's a little hard to watch R snack on brains. 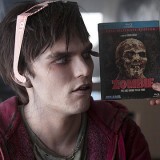 It’s any wonder Warm Bodies, yet another zombie apocalypse flick, has a chance. From Zombieland to Shaun of the Dead, there’s been a glut of zombie stories in recent years. And yet, director Jonathan Levine’s coming-of-age post-plague film somehow manages to carve out a niche. The particular zombie (Nicholas Hoult, who you may remember as the young kid in 2002’s About A Boy) at the center of this film can’t actually remember his living name, so he refers to himself as R because he vaguely recalls it beginning with the letter “r.” He’s foraging for food one day in his usual slow zombie stupor when he meets Julie (Teresa Palmer), one of the few remaining humans left in the world. One look and he’s suddenly in love. Problem is, she and her boyfriend are retrieving some much-needed supplies and they’re armed to shoot anything that gets in the way. Meanwhile, R is in the company of a posse of hungry walking corpses. So, when plans go awry, the boyfriend becomes dinner and R whisks the object of his affection away–ostensibly so the other dead folks don’t kill her. R keeps Julie safe in an old jet plane that he’s turned into a hovel. He even trains her to walk like a zombie so she’ll blend in. Funny thing is, R finds himself becoming more human the more he spends time with Julie. And though Julie quite as enamored with him, she’s definitely impressed by his vinyl album collection. The two begin to connect in a strange way that even she doesn’t understand. When Julie goes back home to see her father, General Grigio (John Malkovich), the leader of the world’s last few surviving humans, she’s got to make a hard sell. Grigio doesn’t believe zombies can be saved and doesn’t want to give in to his daughter’s supplications to the point that he’ll reconsider his plans to destroy them all. But R is such an exceptional case, even Grigio has to rethink his policy. While the movie predictably concludes with a bloodbath, it’s infused with a little humor and a lot of heart, somehow managing to make its brain-eating Romeo and socially conscious Juliet storyline work. At least part of the credit goes to Hoult who does a masterful job of portraying the subtleties in R’s transformation from zombie to human. While Warm Bodies will likely never be more than cult movie, at least it should help launch Hoult’s career.